I know, I know. How could I get any more boring than boring old Abzan, scourge of Modern and Standard alike (seriously, I can’t have been the only one to heave a colossal sigh of relief when Siege Rhino rotated). Abzan has certainly been a mainstay in Modern for some time, presenting the pointed contrast of Path to Exile and Lingering Souls to Jund’s Lightning Bolt for metagames where they shine. What’s interesting regarding BGx builds of late are the new crop of tools that Eldritch Moon has brought into the mix—headlined by the exciting new pseudo Tarmogoyf on the block, Grim Flayer. These builds debuted some time ago, but to my mind at least, it was an open question of where they fell on the “cute new tech” scale. Seeing them appear in not one, but two World Championship teams’ deck lists feels like a strong indication that these new BGx builds are the real deal. The lusophone crew of Thiago Saporito and Marcio Carvalho showed up with one build of Grim Flayer Abzan, while the Channel Fireball team of Luis Scott-Vargas, Mike Sigrist, Paulo Vitor Damo da Rosa, and Sam Pardee (one fourth lusophone, I suppose?) played another. Abzan itself boasted two more competitors, and adding in the two Jund players gives us a whopping ten competitors who chose to battle BGx decks at the World Championship—more than a full 40% of the field. First, our patented Modern Nexus Caveat About Methods: the World Championship presents a highly idiosyncratic metagame puzzle to its competitors, and this in no way represents future predictions of metagame share. We’re talking about a split format (with two other formats, both Booster Draft and Standard), but also a strange environment regarding the opposition competitors face. With only 24 players total, and the overwhelming majority of them among the best in the world, you’re sure to encounter some odd data. The competitors obviously identified BGx as a good choice for this event, but this kind of careful, predictive metagaming is not generally possible in “live” Modern events with larger attendance. My first thought is that Abzan is better positioned than Jund to take advantage of Grim Flayer due to the presence of Lingering Souls. That gives us something productive to do alongside Flayer without diving into more convoluted graveyard stuff like Traverse the Ulvenwald. BGx has never been about high-synergy combos so much as pound-for-pound excellent individual cards, so it’s nice to leverage Grim Flayer‘s ability with cards we were already running. Mishra’s Bauble does make an appearance (as it has been wont to of late), but largely this is just an old-fashioned Abzan deck with Grim Flayer tacked on for good measure. A hit or two with Flayer should be enough to get you to delirium, and getting even one scry trigger is pretty gravy on a beefy two-drop that can already tussle with much of the format. The Noble Hierarch‘s in LSV’s build (by no means universal at this point) also help Flayer trample over to start the value train rolling. While the scry ability normally doesn’t qualify as card advantage per se, any Lingering Souls you mill changes the equation, effectively drawing you a free card. Of course the concession we make to run the mad hermit of Innistrad is cutting the Great One himself, Dark Confidant. Nobody is likely to argue any time soon that Grim Flayer can compare to Bob on sheer abstract power level, but that life loss in a format with absurd aggro decks like Affinity and Naya Burn is nothing if not a liability. We haven’t seen the last of Dark Confidant in Modern, but I see Grim Flayer occupying a similar role as the Abzan archetype itself—responding to specific metagames where you’re better of Pathing (or Flaying) than Bolting (or Bobbing). 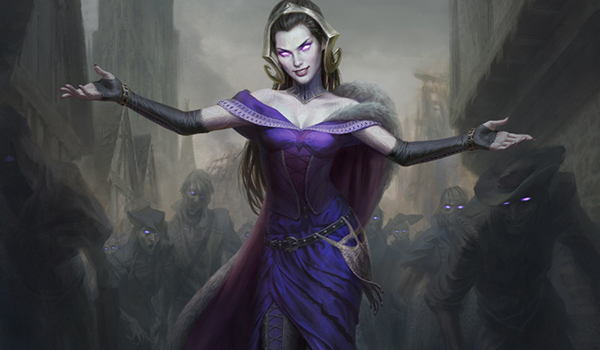 The other significant contribution Eldritch Moon makes to this deck is Liliana, the Last Hope. It was a more prominent part of other competitors’ Abzan lists, appearing as a one- or two-of in the maindeck, but LSV’s team decided to relegate it to the sideboard. In this field specifically Lili’s newest version seems light-years ahead of her “of the Veil” incarnation, murdering Souls tokens with aplomb rather than enabling them for your opponent. Liliana, the Last Hope seems better against aggressive fields in general, killing infecters or robots pretty easily and frequently blanking an attacker if the -2/-1 isn’t enough to finish anything off. Obviously when we’re facing down combo or control we much prefer the attrition-based hand shredder Liliana of the Veil, and nobody at the World Championship trimmed down to fewer than 3 copies of the classic Modern staple. Finally, Collective Brutality again shows its face, promising flexible and never-dead utility at a slightly increased cost. I’ve written about this card before, and here it serves the same purpose as elsewhere. Izzet Charm has played a similar role in blue-red decks for some time, appearing here and there when the blue-red mage wanted to hedge their bets with a card that’s live against aggro, combo, and control alike. The difference with Brutality is the ability to just pick multiple modes—at which point the inefficiency of a two-mana answer is eviscerated and you end up with two one-mana spells. In the proactive and tempo-oriented wilderness of Modern this is nothing to sneeze at, and we get to run it right alongside the other hyper-efficient interaction like Lightning Bolt, Path to Exile, or Thoughtseize. From there this is just more of the same old tried-and-tested Abzan, grinding down the aggro and combo decks and presenting undercosted threats like Flayer, Anafenza, the Foremost, or Tarmogoyf against control. As I said before, I think the new technology of Grim Flayer is likely to be just one more tool in the BGx player’s arsenal, to bust out when conditions call for it. In other news, I plan to bring you the August Metagame Report this Wednesday. Next week I hope to have some more news regarding the Primers I promised you all. I’m still trawling for contributors to that project, so if you know a given archetype well, we’d love to hear from you. Questions, concerns, comments—as always hit me up in the comments or at jason@modernnexus.com. The comparison between Bob and Grim Flayer for an Abzan shell is a bit odd – Abzan hasn’t been running Bob for quite a while, mainly because it has a significantly higher curve than Jund, which makes Bob riskier. Swapping Bob out for Rhino does ameliorate some of Abzan’s durdliness, but it does so by leaning even harder on the graveyard, which exposes it to splash damage from Dredge hate. This seems like a metagame-specific call, and I’m not sure that metagame truly exists outside of Worlds. Collective Brutality and Liliana, the Last Hope are legit, though (much more so than I had assumed), so I would expect to see them in Abzan 75s going forward. My mistake on the lack of Dark Confidant in Abzan; I did not realize that. I will say, though, these aren’t the first people to play Grim Flayer in Abzan or Jund, and pros of this caliber playing the card is a strong endorsement, regardless of the specific surrounding circumstances. Are you guys going to do an article for the upcoming banlist? Also, in Mardu modern, I have been currently testing a very strong tokens version, essentially BW tokens with a more midrange twist and some better removal over a more all in tokens strategy. Has Mardu been getting any attention in modern because Im starting to see more of it pop up. Which maindeck configuration did you choose? I am struggling with my own build of Mardu midrange and it would be interesting to hear about your findings, if it does not bother you. Hey Jason! I like to fashion myself as a pretty experienced burn player, and was wondering if you already had someone doing that write up? I’d be willing to try, at the bare minimum! Thanks for all the great content!